Many homeowners don’t think about HVAC maintenance until there is a serious problem and they need help to fix an emergency issue. That is why we recommend that HVAC systems are serviced at least twice yearly, once in the spring and once in the fall. We stress the importance of fall maintenance because we not only check for issues that need repairs before they become a bigger problem for your wallet, we also check for health hazards that need resolving before they become a big problem for your family. During fall maintenance, we check for things like faulty wiring, clogged ventilation, and worn out coils to prevent fires. We also check carbon monoxide levels in the home to ensure your heater can be run safely. Carbon monoxide is an odorless, dangerous methane gas that when left unchecked, can cause serious health complications, and even death. Regular maintenance gives homeowners peace of mind that their family is safe and warm throughout the heating months. 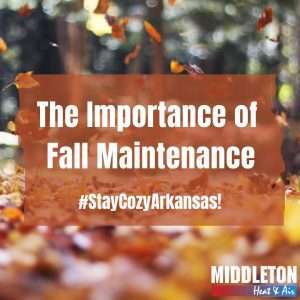 Without fall maintenance, the odds of a heating emergency do increase and could lead to the costly situation of having to replace your current HVAC system during the cold winter months. For an HVAC system that is properly maintained, its components can last anywhere from 15 to 25 years, in the best case scenario. Furnaces on average last 15-20 years, heat pumps 16 years, and air conditioning units 10-15 years. However, a system without regular maintenance can lead to accelerated component wear and a dramatically shorter lifespan. In addition to maintaining the health of your system, some manufacturer and extended warranties also require the equipment to be regularly maintained by licensed professionals in order to maintain coverage. Our Middleton techs are standing by to come and maintain your system and ensure your safety and peace of mind this fall. If you’d like to schedule your fall maintenance, call us or visit us online or by phone at 1-800-404-0371.